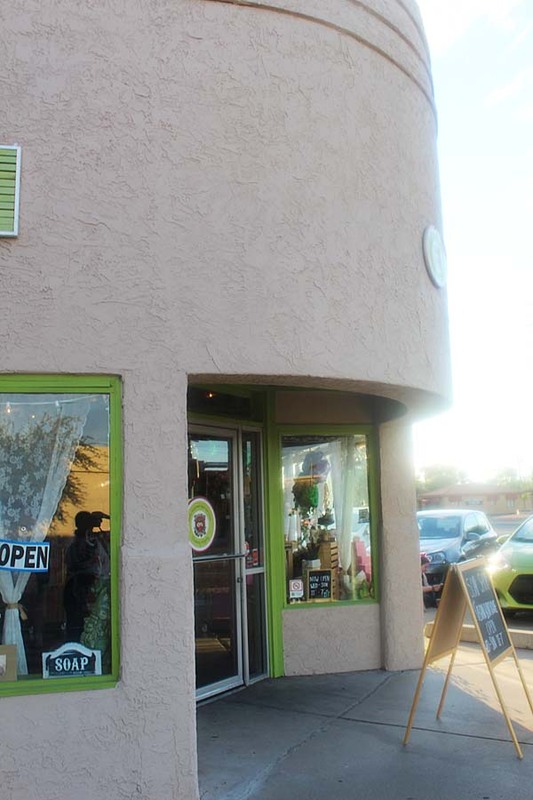 Phoenix’s “IT” vegan soap shop and boutique- Strawberry Hedgehog, just recently celebrated their One Year Birthday. Loyal customers and friends flocked to the store to support owner Tracy Perkins. Tracy is still a one-man show, but now has the help of a few family members and employees. All her soaps are vegan, cruelty-free, and made in small batches. The shop also carries a variety of vegan goodies from local artists and brands. That evening, the celebration consisted of mingling; sampling some foods from area vegan restaurants, such as The Coronado, Treehouse Bakery, Volstead Public House, La Pupusarita, 24 Carrots, and Green. Everything was yummerific, as always (as Phoenix just has a “thing” for amazing food); especially the Lavender Brownies from Treehouse Bakery, and the Brussels Sprouts (forgive me, not sure which restaurant they are from). There was also a pop-up mini market, which featured some of the brands in the shop, including: Madalyn Nault Accessories, Hoshi Paper Art, Happy Kitty Ceramics, Lila Jo Love, Haus Panther, Fluffy Vegans, Spoonsen Forksen, and Jar of Buttons. Henna artist- La Luna Henna was on hand, creating beautiful masterpieces on guests. I opted for the complimentary chair massage from The Back Rub Company. I literally can’t give enough praise to the masseuse- Sonia. Let’s just say, my back LOVES you! Congratulations Tracy on this and many more successes! Play the slideshow below to check out more highlights from the event.